Does it matter if docs don't like EHRs? Physicians are increasingly dissatisfied with their electronic health records. According to a recent survey conducted by the AMA and AmericanEHR Partners, just 34 percent of physicians said they were satisfied or very satisfied with their EHR in 2014, compared to 62 percent in 2010. While the statistics make for great headlines, should we be alarmed – or even care? To summarize the findings: 42 percent of physicians thought their EHR's ability to improve efficiency was difficult to very difficult; 72 percent believed their EHR made it difficult to very difficult to decrease their workload; 54 percent reported that their EHR increased total operating costs; 43 percent claimed they hadn't overcome productivity challenges related to their EHR. Meaningful use. In order to qualify for MU incentives, physicians must follow prescribed workflows that aren't necessarily efficient. Perhaps users were happier five years ago before the advent of the more rigorous Stage 2 requirements. User sophistication. Most EHRs are not as intuitive, attractive, and easy to navigate as popular websites like Facebook and Amazon or most smartphone apps. Even the most tech-adverse physicians are somewhat familiar with the slicker interfaces that are norm with mainstream applications, so why wouldn't they feel frustrated by their EHR's relative clunkiness? Poor ROI. Most EHRs are expensive to implement and maintain. Physicians typically complain that EHRs are inefficient, interfere with the provider-patient relationship, and reduce productivity. Even with MU dollars, many physicians fail to achieve a positive ROI. The survey also revealed a direct correlation between physician satisfaction and the number of years a physician used his/her EHR. For example, among physicians on their system for three years or less, only 25 percent reported any level of satisfaction; satisfaction jumped to 50 percent among physicians that had used their EHR for five or more years. Over the last five years, EHR adoption has climbed rapidly and created a sizeable pool of novice EHR users. As practices transition to the digital world, productivity typically declines as physicians struggle to learn new software and adapt workflows. Given the complexities of implementing an EHR, it's hardly surprising that early users are less satisfied. However, if experienced users tend to be more satisfied, it seems reasonable to assume that we'll see satisfaction scores climb over the next few years. But back to the original question of whether or not we should be alarmed or even care that physicians are unhappy with their EHRs. I'm of the opinion that physician satisfaction matters, but not nearly as much as improving the quality of patient care. Patient care will be enhanced when all providers have access to thorough and accurate documentation. Ideally the patient records from one provider will integrate with records from other providers to create a single longitudinal record that is easy to decipher and provides a full picture of the patient's health history. Obviously we are nowhere close to achieving that goal but the chart notes that physicians are creating in their EHRs today are providing the building blocks for that single, interoperable patient record. Physicians may argue that their use of EHR is doing little to improve patient care but that viewpoint may be a little narrow-minded. Case in point: My mother had a number of health issues over the course of her life. Among other problems, she had MS and some dementia in her later years. She lived in Texas in the winter and Maine in the summer, and saw physicians in both places. She experienced multiple UTIs in the last couple of years of her life. If she were at the gynecologist for a regular check-up she might have mentioned her symptoms and been prescribed an antibiotic. During a visit to her primary care doctor in Maine about an unrelated issue she might mention another UTI, get another round of antibiotics, and possibly a medication for incontinence. Similar story when she'd visit her doctor in Texas. Often, because of the dementia, she have difficulty recalling how often she was having problems and whether the prescribed meds were effective. My mother was eventually diagnosed with bladder cancer and passed away six weeks later. Arguably if she had had a single, longitudinal record, one of her physicians may have taken note of the re-occurring problem and recommended testing and treatment that could have prolonged her life. 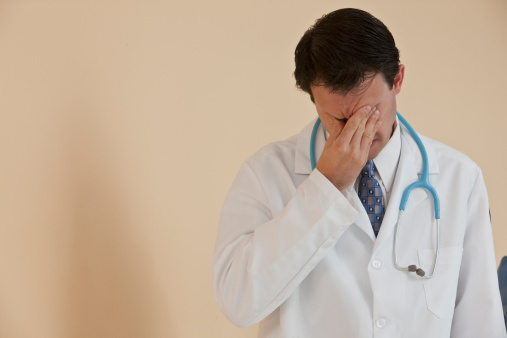 Does it really matter if physicians dislike their EHRs? Should we try to pinpoint the sources of their dissatisfaction and jump through hoops to make physicians happier? Or should we remain focused on the patient and dedicate ourselves to doing whatever it takes to achieve the goal of a single, interoperable patient record that enhances the quality of care?